William John Cavendish Cavendish-Scott-Bentinck (17 September 1800 - 6 December 1879) was a man with a very long name who is better known as the 5th Duke of Portland. His old stomping ground was Welbeck Abbey, where he employed thousands of local people through his various construction projects. Most notable of which were miles of underground tunnels, a roller skating rink and a ballroom where he never held a ball. The Duke's life was fictionalised in Mick Jackson's brilliant debut novel The Underground Man in 1997. At the time of writing Jackson was working part-time as a special needs assistant. His compassionate portrait of a man prone to bizarre, eccentric and often hilarious existential theorising is at the heart of the novel, all of which has been sensitively captured by Nick Wood's adaptation. The play is performed in the dark and intimate space of the Neville Room with the audience seated around a small rectangular space. The Duke was the product of much gossip during his life and so the seating arrangement helped reinforce this sense of enclosure. The minimalist stage, created by NTU graduate Harriet Clarke, consists of a set of cogs, presumably symbolising the mechanics of the Duke's mind, a hopscotch board, a small table with a cuddly monkey and a multi-functioning desk that acted mainly as a bed. The play is a two-hander which focuses on the relationship between the eccentric Duke (Iain Armstrong) and his loyal and incredibly patient butler Clement (Mick Jasper). The Duke immediately comes across as a hypochondriac, constantly searching for remedies for his failing body. But overtime it becomes clear that his problems are psychological and relate to some traumatic childhood experiences. The Victorian era (1837 - 1901) waved goodbye to the rationalism of the Georgian period and ushered in more romantic and mystical views to religion, the arts and social values. This led to some ill-informed opinions and bizarre theories as to the very nature of existence. The Duke is endemic of this new wave of enquiry, demanding a 'neck man' and a 'head man' to cure him of his perceived ills and has no qualms about consulting with two sisters who claim to be able to diagnose illness by seeing into the body (all additional parts are played by Mick Jasper). What struck me about this was how little has changed! The internet is awash with fanciful theories and now thanks to social media, everyone has a platform to share them. The Duke's theorising is hilarious, profound, and occasionally beautiful in its naivety - his theory as to what happens to buried bones under the earth could easily bring a tear to your eye. These are all delivered with an enthusiasm and gusto that's utterly infectious, though he tests the patience of his loyal inner circle who love and fear for him in equal measures. The novel contains two graphic scenes that I imagine are very difficult to emulate on stage. Therefore playwright Nick Wood has wisely decided to leave these to our imagination. I think this works for two reasons: Firstly, Mick Jasper takes on numerous roles throughout the play and so the audience is used to suspending disbelief. But most importantly there is a brilliant scene when the Duke is led down into a pinhole cave at Creswell Crags and the stage fills with a glorious kaleidoscope of colour. It's such a powerful presence on an otherwise dark set that the image comes flooding back when events take a turn later on. Although this is a well-acted and thoroughly enjoyable two-hander, special congratulations should go to musician Nigel Waterhouse who is the Lionel Messi of accordion playing. He was vital in creating atmosphere, the highlight of which was emulating the noise of a train. This play would be of interest to anyone interested in local history. But it's also a meditation on age, life, love and loneliness. Watching a lovable character descend into madness reminded me of Ray Gosling's compassionate and prescient observation of patients at Whittingham Hospital Asylum: "It's a community of very sensitive people." He had a mania for building elaborate tunnels under his house, he was a hypochondriac and a chronic reclusive, he was followed everywhere he went by a floating boy, and he tried to drill a hole in his own head. Adapted from the novel of the same name by Nick Wood, The Underground Man, is loosely based on the life of William, the Fifth Duke of Portland, whose stately pile was Welbeck Abbey in north Nottinghamshire. At first you assume that William is borderline eccentric/mentally ill. By the halfway mark you're forced to conclude that he must be borderline mentally ill/mad. But all the time you know he's courteous, kindly and philanthropic. Most of all he's childless and lonely. It's a highly effective two-hander, with beautifully and suitably understated performances from Iain Armstrong as William and Mick Jasper as his butler Clement, and all the other many roles. Clement also serves as narrator. Brilliant atmospheric background music, and assorted sounds from a moving train to a heartbeat, are contributed by musician and composer Nigel Waterhouse on accordion. He adds an extra dimension to the action as, from time to time, he almost follows the actors about. His expression sometimes puzzled, sometimes sorrowful, reminds you alit of Harpo Marx. This is the mid-19th century, an age of uncertainty when thinking people are questioning old assumptions about the literal truth of the Genesis creation story and the like. William is just such a questioner, writ large. One of the most moving scenes in the play comes when he's being shown round Cresswell Caves, his own property, by the local clergyman/amateur palaeontologist. Directed by Andrew Breakwell, this studio presentation, upstairs in the Neville Room, is a quietly strange, original and riveting piece of theatre. Someone ought to adapt it for Radio Four. The Underground Man, an award winning novel by author Mick Jackson is a fictionalised account of the real life eccentric Nottinghamshire aristocrat William Cavendish -Scott-Bentinck (1800-1879). The semi-recluse is renowned for building a maze of tunnels, through which one could drive a horse and cart with ease, under his estate as far out as Cresswell Crags. Although a philanthropist William never wanted to meet people if at all possible excepting the tenants of his vast estate for whom he had a fatherly fondness. In this excellent Nottingham Playhouse theatre adaptation by Nick Wood the Neville Studio space sees itself transformed into a long playing space with seating either side. The open set design (Harriet Clarke) is bookended by giant cogs like the interior of a time piece or perhaps even representing the boring mechanism used to excavate the tunnels. They could also represent the passing of time in William's crazed tick tock head. Associate artist Andrew Breakwell directs the one hundred minute piece with fine tuning and inventive usage of the space. Although it seems like a whole village of people on stage at times the piece is admirably performed by only two actors namely: Iain Armstrong (William) and Mick Jasper (Clement and other characters). Musician and composer Nigel Waterhouse is regularly within and without the story accenting the various moods through the musical medium of the accordion. The unobtrusive incorporating of this level and style of presenting live music is quite magical. Armstrong portrays William superbly as an eccentric temperamental old man plagued by real and imagined illnesses; a sour stomach, crippling intestinal pains that are comically relieved by a massive candle lit fart that nearly sets the bedroom alight; severe back and neck pains, imaginary stones and constant references to a medical tome for his maladies. William has strong concerns over failing memory "Deprived of our memories we are deprived of our very selves. Without our histories we are vacated. We may walk and talk and eat and sleep but, in truth, we are nobody." Armstrong's William professes a great admiration for engineers who 'put things together without the head getting in the way' and yet he also ponders the nature of the 'everybody' of his time who he believes know next to nothing about their bodies and remonstrates that we should be given a manual at birth. Throughout the later part of the play it is his own head and maze of troubled mind which give him the most concern as he falls into mental decline. Some regular wry humour within the piece gives it great balance as a compelling work of theatre. In contrast to William's hypochondria and flakey ways the man servant Clement, terrifically played by Mick Jasper, offers constant support to William throughout. His portrayal is under-stated acting at its best - the character deferential to his master - yet with occasional bouts of speaking his own mind out of frustration. Particularly moving is a scene where William has locked himself in his room and the servant comes again and again to implore William to eat or come out from his recluse without knowledge of why he is hiding away. In a play which asks the actors to present nearly two hours of text Jasper is especially brilliant in his depiction of several characters including the stroke affected gardener Mr Snow, the Oakley twins (ladies), Connor the blind bone setter, the Rev Mellor, Edinburgh based Professor Bannister and the loathed Doctor Cox. Nick Wood's sterling, atmospheric, adaptation plays with the form by bringing in the haunting presence of 'the floating boy' as leitmotif. The real nature of this unseen character is only revealed at the end of Wood's gently captivating play re-inventing the life of one of Nottingham's great eccentrics. A triumph of pared-down theatre, The Underground Man is a fascinating portrayal of the life of the eccentric Victorian Duke of Portland. The play is adapted from the Booker Prize-nominated 1997 novel by Mick Jackson - a part-fiction, part-fact 'biography' full of humanity, humour and pathos, all fully reflected by Nick Wood in his new version, developed for the Nottingham Playhouse. Director Andrew Breakwell conjures wonders with just two actors, a crisp script, a simple effective set (inspired by Calke Abbey) and live music and sound to colour the action. With the audience gathered in the round, in the intimate setting of the Neville Studio, this is theatre in its purest form. Iain Armstrong is the faded, fading aristocrat who gives the works its title - a lonely, somewhat otherworldly and out-of-time figure whose sole daily companion is his butler Clement (Mick Jasper). Armstrong is glorious, keeping a fierce, questing intelligence at the heart of the Duke's passing perplexities and sudden superstitious unease. He is aging, yet childlike, seeking to know why his body hurts so, haunted by a ghostly image of childhood. The demands he puts upon the exasperated Clement form much of the play's humour. Jasper, a co-founder of ajtc Theatre Company (who jointly produce here), rarely leaves the stage. His performance is poised and controlled, fluid and compelling as he shifts from persona to persona, playing the multiple other characters the Duke occasionally encounters and summoning their spirits with brilliant gesture and minimal props and costume. The leads' voices are mature, strong and assured as they deal with the order and disorder of the Duke's hypochondriac dissolution. He orders tunnels dug (wide enough to take a coach and horses) so he doesn't have to be seen in the open. He travels the country looking for medicines or techniques to ease his ailments and becomes fascinated by trepanning, where a hole is bored into the skull to relieve 'pressure on the brain'. Wood takes the gruesome description of this procedure straight from the pages of the book and makes the audience gasp with imagined horror. Harriet Clarke's clever minimal set is inspired by Calke Abbey and reflects the shifts and decay in the title character's mood. The final tragedy comes just before the mystery of the ghostly figure is revealed, in a marvellous and imaginatively told story of a man whose life quest seems is to play the detective to his own psyche, constantly digging away to reveal the truth of his past. The performance I attended was accompanied by thunder and lightning outside which only added to the atmosphere as the drama unfolded. 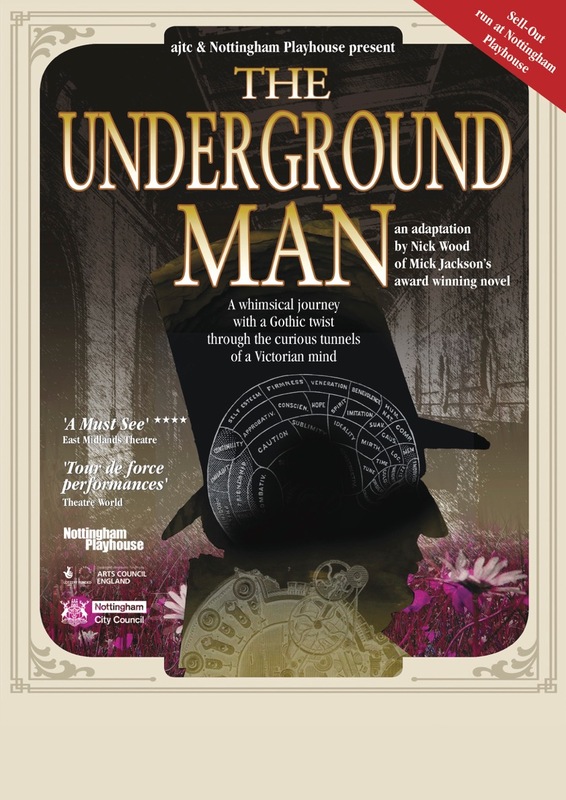 ajtc Theatre Company &Nottingham Playhouse Theatre Company Present The Underground Man, a dramatic adaptation by Nick Wood of Mick Jackson's novel of the same title. The 5th Duke of Portland was, by any measure, a man possessed of extreme eccentricity. Some would consider him to be, as an American would express it, possessed, period! It is he who forms the pivotal point of this piece. Or, rather, a version of him. Some of what we witness bears historical authority; some of it is what the original novelist openly admits to be the result of ". downright liberties [having] been taken." What is indisputably true is that the actual Duke did create a network of tunnels beneath his stately home, Welbeck Abbey. It exists to the present day. But why did he undertake this extraordinary feat of subterranean engineering? To investigate that question is at the heart of this adaptation. The play is a two-hander (plus quintessential Musician.) The Duke, himself, is played by Iain Armstrong; Clement, his factotum, is played by Mick Jasper, who also enacts: an engineer, a coachman, a blind proto-osteopath, a university professor, a clergyman, and one half of a pair of twin-sister psychics of the Madame Arcite school. Sufficient reference is made to a Housekeeper, a Doctor, sundry Cottagers, and an ethereal being called 'The Floating Boy' as to turn a two-hander into a mini-epic! Ensuring that the individual episodes out of which the text is constructed cohere is an accordion-playing Musician, Nigel Waterhouse, who follows in the tradition of both Silent Movies and the subsequent Talkies: he controls the changing moods and atmosphere of the play. Director, Andrew Breakwell, in cahoots with Designer, Harriet Clarke, has echoed the author's magical marriage between austerity and plenty: one ingenious item of furniture proves itself to be sufficiently adaptable to create multiple locations. Of other "set dressing" there is little. This team's philosophy is definitely that 'less is more'. And the team is right! Both Armstrong and Jasper present us with tour de force performances, holding our absolute attention for two halves of approximately 45 minutes, each. Especial praise should go to Jasper for his deft and subtle changes in character, using only minute changes to his costume. All is achieved through modulation of the voice; it is a display of the vocal dexterity Dickens called 'monopolyogue'. But is this "mere entertainment"? I would say not. It embraces the post-Darwinian crisis of the nineteenth century; a crisis only the foolhardy consider to have passed into history. It reflects the tug-o'-war between modernity and tradition; between progress and poppycock; between myth and mystique. "There are," Hamlet reminds Horatio, "more things in heaven and earth than are dreamt of in [our] philosophy". Whether Hamlet is insane or inspired remains an issue Shakespeare forces us to contemplate, though he never allows us an answer; Jackson/Wood pose much the same question through their historical/hysterical ducal creation. It's a winner!